More and more people across Connecticut are going solar when it comes to powering their homes. According to state records, solar panels are going up on homes in Connecticut at a rate of 1,000 per year, a rate that is double what is was just a few years ago. Benoit has a 20 year lease. He put $13,000 down up front, has no payments, and expects to make that amount up in savings in five years. His $200-per-month electric bill is now cut in half. "Any time a bright sunny day like today is usually probably a third of it is going back to the grid at least. And that appears as credits at the end of the month on my electric bill,” he said. Some who have converted to solar, like Gary Williams, of Glastonbury, take advantage of state and federal subsidies. Williams bought his solar panels in April. “With the state and federal programs that are helping fund this, it’s 50-percent off,” Williams said. Williams benefited from a program called Solarize Connecticut, where towns get a group discount on solar, and contractors are already screened for homeowners. So, why is the cost of solar energy for homes suddenly more affordable? The state Clean Energy Finance and Investment Authority, or CEFIA, says besides buying a system outright, there are now lease arrangements with little or no money down. “Where it was maybe a little bit affordable for folks to go solar before, now it’s making a ton of sense," Kerrie O’Neill, a spokesperson for CEFIA. The price of an average solar array in Connecticut is $30,000, down from an average cost of $54,000 five years ago. There are some pros and cons when it comes to fitting a house with solar panels, and it won't work for everyone. If the roof doesn't get enough sun, or if the roof is a few years away from being replaced, solar power won't make for a good choice. For homeowners who buy the panels, they are responsible for maintaining them and storage of solar power isn't affordable, so the power not used is kicked back to the grid. Homeowners are paid for that excess power at the wholesale rate. When the house is sold, the panels come with it, unless the homeowner pays to have them removed. 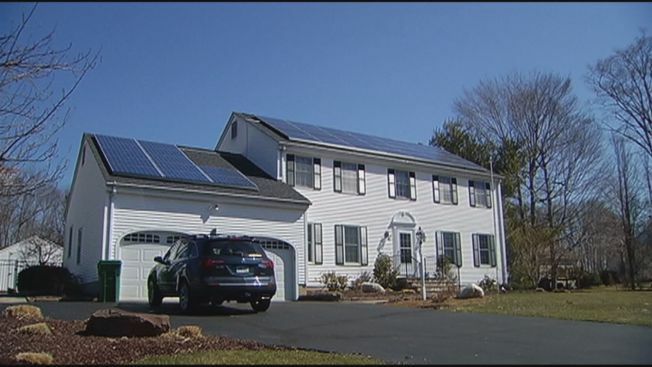 In the case of the Curran family in Waterbury, they believe the solar panels they bought will make their home, which is all electric, even more appealing to a buyer. While a solar panel installation takes just a few days, the project must be signed off by town inspectors, and the local utility. To learn more about the different grants, credits and financing available for solar, click here or here.